This historic event is to mark the birth of the Sikh religion and is marked with various religious events, processions and festivals throughout the world. Although this year the actual date for the event was 14th April most of the Gurdwara in the UK hosted their prayers this weekend. Here in Dartford the changing of the flag outside the Sikh temple (Nishaan Sahib) took place at 8.30am which was then followed by hymns and prayers inside the temple. In their address to the congregation, both of the candidates recognised the commitment the Sikh community in Dartford make in business, education and employment - the community is one to be proud of. Gareth Johnson highlighted how in one of he's first addresses in the House of Commons he spoke about the Dartford Sikh Temple and its community. Both candidates congratulated the community on Vaisakhi and looked forward to working with the community in the near future. 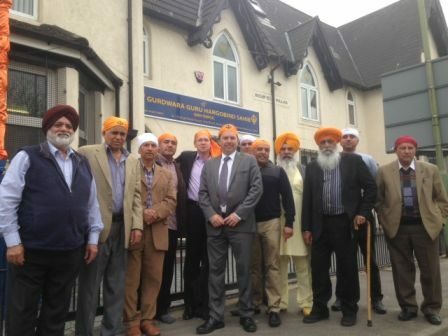 For more information on the Dartford Candidates Mark Vaisakhi, please contact us today.